Raccoons are often curious and mischievous. 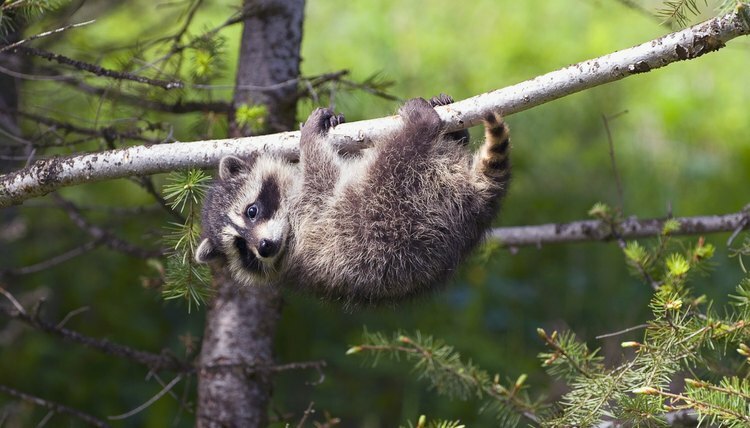 But if your pet raccoon is acting lethargic or aggressive, you may wonder if he has contracted rabies But, often, it's not rabies that is making the raccoon sick, but instead your cute and clever pet may be suffering from distemper. Distemper is a disease caused by a virus similar to the measles virus. Raccoons are susceptible to both canine and feline distemper viruses, although the canine distemper virus is more often a threat to both pet and wild raccoons. Distemper transmits via airborne droplets that may be generated by a sneeze, a hiss, or eye or nose discharge. Distemper can spread through contact with any bodily fluid, including blood, saliva or even waste droppings. One common way pet and wild raccoons get distemper is from encounters with unvaccinated domestic dogs and cats. In wild raccoons, distemper tends to run through populations every five to seven years but can infect raccoons more often. Juvenile raccoons are most susceptible, although severe infections may wipe out entire wild raccoon communities. You should be able to see many symptoms of distemper in a pet raccoon. Canine distemper usually begins with a respiratory infection, weepy eyes and a runny nose. A raccoon, like a dog, might become lethargic and lose appetite. As the disease progresses, a raccoon may develop pneumonia or diarrhea. In the final stages, neurological symptoms appear, including confusion, paralysis and seizures. The disease may take up to six weeks to run its course. Feline distemper, also known as panleukopenia, is not as common among raccoons but is just as deadly. The disease progression is much quicker, usually lasting less than a week. Symptoms of feline distemper include a high fever, vomiting, diarrhea and leukopenia, a white-blood-cell deficiency that's almost always fatal. The symptoms of distemper and rabies are very similar. It is virtually impossible to distinguish between the two diseases just by looking at a sick raccoon. Both canine and feline distemper, like rabies, cause infected raccoons to become aggressive toward people and other animals. Unfortunately, there is no cure for distemper in any animal, including raccoons. Immediately consult with veterinarian if you suspect your pet raccoon may have distemper. Supportive care may help ease the symptoms of the disease and may consist of fluid therapy, antibiotics to prevent secondary bacterial infections, and nutritional support. Even with aggressive supportive care, most cases of canine distemper are fatal; almost 100 percent of feline distemper is fatal. Most infected raccoons are humanely euthanized, and many are tested postmortem to confirm a distemper diagnosis instead of rabies. To prevent distemper, pet raccoons may receive the same canine and feline distemper vaccines that dogs, cats and ferrets receive, although the vaccines are not specifically labeled for raccoons. All domestic pets in the same household as the pet raccoon should be regularly vaccinated against distemper. Most wild raccoons that are rehabilitated and released back into the wild also receive vaccinations against distemper. Wildlife Education: HELP! I found Orphaned Baby Raccoons!